The holidays are all about consumption, but the nice thing about giving a sustainable transportation-oriented present is you’re encouraging the recipient to use less resources, by walking, biking or using transit when possible, instead of driving. Most of the following gift ideas are also locally produced and available at independent stores, which means a minimum of fuel was expended in transporting them, and by spending money at a mom-and-pop instead of a big-box you’ll be promoting pedestrian-friendly retail. Unfortunately, one present you can’t give right now is a glitch-free Ventra card. However, you can promote one of Chicago’s more successful transpo initiatives by giving the gift of Divvy. The bike-share system will be operating all winter long, so if you buy your loved ones twenty-four-hour passes ($7) or yearly memberships ($75), they’ll be able to hop on one of the baby-blue cycles right away. Passes and memberships entitle the holder to an unlimited number of thirty-minute trips, so they’re perfect for short trips and errands, plus “last mile” rides from transit to one’s final destination. DivvyBikes.com; email Gifts@DivvyBikes.com to purchase gift certificates. For the long-distance cycling enthusiast or Iowa expat on your list, local author Greg Borzo’s new book “RAGBRAI: America’s Favorite Bicycle Ride” is corny in all the right ways. [Full disclosure: I helped edit the book, although I don’t receive proceeds from sales.] Borzo, whose history books “The Chicago ‘L’” and “Chicago Cable Cars” also make great gifts, has captured the spirit of the wacky, beer-soaked annual bike ride across the Hawkeye State with an in-depth look at its thirty-year saga. The most colorful character in the book is Clarence Pickard, an eighty-three-year-old farmer who completed the 443-mile tour on a girl’s Schwinn, wearing a silver pith helmet. $22.99 at the Book Cellar, 4736 North Lincoln, HistoryPress.net. For cheap stocking-stuffers, give gift cards to the iTunes App Store or the Google Play Store, with a note suggesting recipients install the Chicago Bike Guide, the Swiss army knife of cycling smartphone applications, created by my blogging partner Steven Vance. It features a map, route suggestions, and Divvy stations and availability, and it provides the only mobile reader for events and discussion topics from TheChainlink.org. Best of all is the built-in guide to thirty-nine of the city’s best burrito joints, perfect places to refuel. $1.99 for iOS and Android, OfflineBikeMap.com. The Chicago Transit Authority’s online gift shop is a great place to buy presents for rail fans, with more than 100 bus- and train-themed items. I’ve gotten plenty of mileage from the necktie featuring a map of the ‘L’ system that someone gave me for Hanukkah a few years back. New this year are table lamps featuring the map on the shade and, for the little ones, pint-size track worker costumes. Some of the coolest swag, including mugs with a stylized image of the Loop El, and t-shirts with hand-embroidered maps, are produced by Transit Tees, a brick-and-mortar store at 1371 North Milwaukee. Various prices, CTAGifts.com. Why buy someone a cell-phone case for their messenger bag that was made in China under dubious circumstances, when there’s a dude right here in Chicago who can custom-sew you one that’s more waterproof than a Timbuk2? Knickerbakken makes cases in four sizes from rugged Cordura, and you can choose from sixteen cloth colors and nine shades of binding tape. Tweet to @Knickerbakken or email dirkenb+knickerbakken@gmail.com to place an order. PoCampo is one of our city’s most successful homegrown bike-accessory brands, and many of their well-designed bags, named after Chicago neighborhoods, are still made in the area. Recent models include the Roscoe Crossbody ($60), a cute waterproof tote with broad blue-and-white stripes, and the Humboldt Messenger, made of handsome, brown waxed canvas and designed to hold a fifteen-inch laptop or a six pack of beer. For every twenty-five bags sold online, PoCampo donates a bike to an African schoolgirl via the local nonprofit World Bicycle Relief. Products sold at stores citywide, PoCampo.com. As a gift for that someone special, a new ride from Heritage Bicycles is sure to score you points. Recent models include the Goblin, a heavy-duty lakefront cruiser, and the Jane, a lightweight step-through bike featuring an eight-speed hub. Reward yourself for your generosity at the shop’s café counter with a cup of Stumptown joe and a toothsome pastry from Little Goat Bread. For the kids, nearby Heritage Littles offers pedal-less cycles like the Bennett Balance Bike ($250), plus a milk-and-cookies bar. Heritage Bicycles, 2959 North Lincoln, HeritageBicycles.com; Heritage Littles, 2868 North Lincoln, HeritageLittles.com. When you reach for refreshment during a hot bike ride, Jeppson’s Malört, the Windy City’s painfully bitter, quasi-indigenous spirit (it’s made in Florida nowadays) probably isn’t what you have in mind. 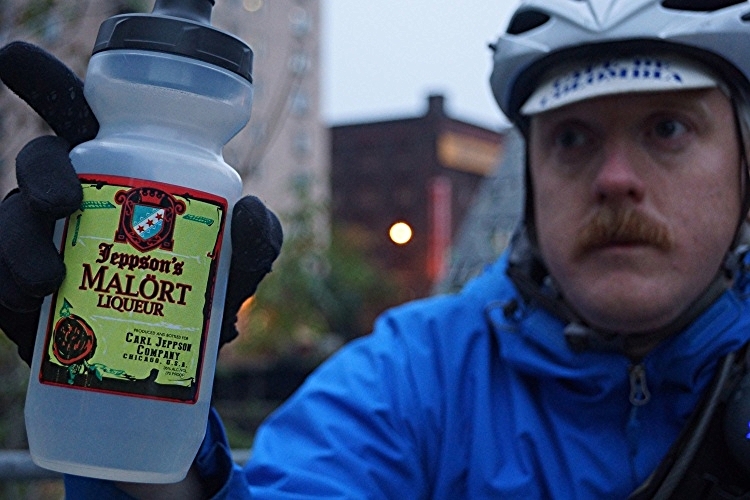 Still, for an ironic gift for your favorite mustachioed pedal pusher, you can’t go wrong with the Malört Water Bottle, designed by Tim de la Motte. “It is a drink that’s so damn Chicago that it feels like you got punched in the gut by Michael Jordan with a deep-dish pizza wrapped around his ring-clad fist,” he gushes. That’s all fine and dandy, but if you actually put the wormwood-infused rotgut in the bottle, will it eat through the plastic? $15, MalortWaterBottles.BigCartel.com.